A car battery looks like a harmless box of plastic but is probably one of the more volatile parts of your car if you don’t buy the right battery. So how does one know if a battery is safe to use? For this, you need to understand a few points about what happens inside a battery. Lead and lead dioxide plates are immersed in an electrolyte solution that is made up of approximately 35-40% sulphuric acid and the other 60-65% being water. While being charged in the running of the car, the resulting chemical reaction generates electricity to run the electrical of the car. So far so good. This is where the designers have to take care of a few problems that arise because of the good old-fashioned chemistry that is happening inside the battery. The problem happens when the battery gets overcharged due to constant running which results in the water being split due to electrolysis of water. Hydrogen is produced and this is known as gassing. This gas needs release and therefore the battery designers provide vents for the release of the gas. In SF Sonic batteries you will find a pioneering Side Vent mechanism that allows no build-up of gassing to happen. There is also a top vent mechanism which uses specially designed vent plugs. What this helps in, is that, it prevents batteries from overheating and swelling up thwarting potential explosions ignited by internal sparks. Another way gassing is kept at low levels is to reduce water loss while being charged, that is water remains as water and does not split. Again in SF Sonic batteries the Grid Alloy technology keeps water loss to lowest level in the industry thereby ensuring utmost safety during battery operation. As you have read so far, the electrolyte solution is fairly volatile and has sulfuric acid. Leaks of any kind leads to burns and corrosion. Therefore it is important that the first thing to ensure is the right amount of acid is filled into the battery. Then the battery is checked and re-checked at all the welded points to ensure nothing is leaking. At the SF Sonic factory acid-filling is automated and computerized. The perfect levels are maintained. And then the battery body and sealing is checked by both automated and manual fool-proof systems before being certified safe. The battery designers have created what is known as a torturous path for the venting of gasses so that the acidic vapour released by the electrolyte is not vented out, almost like a filtering mechanism for your understanding. Because even the acid vapour can be harmful and therefore the battery design ensures it stays within the battery body. The other feature that is worked on is the tolerance to vibration because even this can lead to spills. The SF Sonic battery is built in a way that it resists even the worst of vibrations something that is needed in a country like ours with poor roads. It’s a highly volatile chemical mix inside the battery and it takes only a spark to burst the battery. There is as much wiring inside a car as you would find in a room. Short-circuits can happen any time, sparks can fly. The strength and fusion quality of every joint should be top notch and there can be no loose and weak connections. 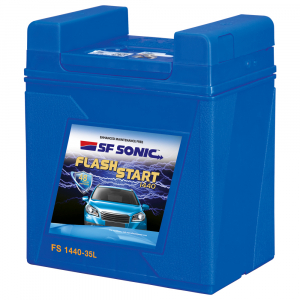 You need a Burst Prevention Systemlike the one found in an SF Sonic battery that ensures that happens 100%. Plus the covers are fitted with special spark arrestors. These spark arrestors provide resistance to the propagation of spark inside battery, ensuring safety. Just to remind you of a few safety points you too need to take care of when handling car batteries. Wear protective equipment (goggles, overalls, gloves) to avoid injury by acid spills when handling car batteries. No cigarettes, matches, lighters or any source of sparks should be anywhere near a battery. We say as also as a rule just don’t smoke, that’s good for your battery and for your lungs too. You should ensure that the final connection (or disconnection) of a jumper cable should be to the car’s frame rather than the grounded terminal of the battery(this point source http://en.wikipedia.org/wiki/Automotive_battery); doing this keeps any potential sparks further from the battery.